and the United States declined further during July. cutting down imports of cured pork into that country. appears to be the main consideration, although flavor is also a factor. Kingdom were also unusually small. expected to continue heavy well into 1932.
increases in all. classes except brood sows and fat hogs over 220 pounds. with numbers in Germany and Denmark. coming fall according to .the June Pig Survey. relationships are more favorable for feeding than the hog-corn :ratio indicates. mar-keting it through hogs. .
in June last year were the lowest-since 1922. Hog numbers in 1930 in 18 countries, exclusive of Russia, were still . below the record number reported in.the years 1927 and 1928 by 2 per.cent. average of 24,651,000 in 1927-28.
a/ Germany, Denmark, Irish Free State and Belgium. Germany : France :slovaki: Austria: Italy. Dec. / Dec. :Dec. ii: Dec. i/_Mar-Apr. a/ Countries arranged in order of importance as exporting or importing countries. boundaries estimates are for 1 year only of numbers within present boundaries. as of January of the following year. j,/ Estimate for present boundaries for 1918.
k/ March. 1/ October. No estimate available for December 1923. m_/ Unofficial. b/ Ten months and over. d/ See table page 24 for June 1931 estimate. a: For years ended May .31 following. for numbers within present bouAdaries. 1916, 6,348; 1917, 5,795; 1918, 2,430. England and Wales, 4,890,000 in 1929-30 compared with 6,178,000 in 1928-29. Agricultural Output of Engl -nd and '7ales 1925. SSeason accepted as most representative for the- United St..tes. c/ Adjusted from weekly figures. good packing sows as against '0.71 and "1.81 respectively, in July 1930.
cent undor that of the corresponding p. riod. in the 1929-30 marketing year. above those of Juno. The price sprbed between light and heavy loins continued. loins in that market averaged $13.46 as against "13.81 in June and $15.58 in. July last year. The cured pork mar-cet strengthened s.aneuhat during the month. occurred in prices of l:.rd substitutes. ratio based on Chicago prices -w.s 10.7 in July as compared with 11.0 in Juno. hogs to an .dv:.ntago in many sections. 93 per cent in Germany. negligible quantit'. of 38,000 pounds as compared *iith 1,00S,000 in June 1930.
reduction of 27 per cent in the total r.ove;icn't. year that lard exports to United Kingdom have been smaller than a year earlier. those of the July 1930 and not greatly different fro,. the July 1 5-year average. and 28 per cent smaller than the 5-year July 1 avjrage. 11.6 *)r cent larger than on July 1, 1930.
reductions on dry salt backs. Available for consumption a/ "
Pork. ... : ." . Apparent consumption b/. .: "
a Total dressed weight + imports + storage October 1.
.* : ; : : .| : : U"
Nov. ........ : 13;562 : 8*;507 : --6,:013 : 6,:716 :. 11i452 ... ,446. Aug. ........:- 12,131 : 7:864 : 10'945 :. 13,171 : 6,9.00 ..
Sept. ....... : 14,870 : 11,620 :, 6a881 :. 10a288 : 4.973. ...,. Compiled from the Monthly Summary of Foreign Commerce of the United States. up of supplies at various centers. 92,000 compared with 87,000 for June and only 68,000 last July. sows kept V:as reported as doubled or treblod. bacon imports into the United Kingdom reached 109,000,000 pounds. That figure. December. Practically all of the increased imports of recent months have been. were 11.3 per cent larger than imports for the corresponding months of 1929-30.
the British Isles and exports live hogs, fresh pork and bacon to England. 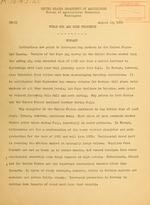 Compiled from Trade and Navigation of the United Kingdom. . Compiled from Trade 1'nd Navigation of the United Xingdom. hoes in Danish agriculture precludes any exteAsive decrease in'production. being made to produce a hog more suitable for'the "orman'trade. lard is -orcforred to butter. there was an accumulation of bacon stocks from Denmark, Holland and Poland. July hogs numbered 4,928,000 and by January 1931 had increased to 5,232,003.
rclationship between hog production and D.nish fnrming, especially dairying. and farrowings this fall may be cxpoctcd to decrease, Hr. Christy reports. croasod farrowings this fall and lighter markctings during the coming year. of 22 per cent. Hoavy hogs, over 220 pounds showed a decrease of 5 per cent. was 241,800 compared to only 209,700 durin, the samn period of 1930.
by Asst. Agricultural Commissioncr Christy. Agricultural Attache Steere and Asst. Agricultural Commissioner Christy. Plus sign indicates increase; minus sign, decrease. for American lard will undoubtedly decrease. desired in the British market. to assume a less favorable aspect. is still expected to exceed 20 million head. prospects for a further decline in the demand for American pork products, Mr.
the corresponding period of 1931.
of sows of 1 year and over was approximately the same as in June 1930.
per cent was shown in these-figures over the same date a year earlier. Probably of most importance is the decline in breeding sows.6 months to 1.
total numbers during the coming.year. estimate the total number will reach 25 million head, the largest in history. ing month a year previous. ration, this advice is likely to be ignored by many breeders as present opera. tions are distinctly unprofitable, especially for tnose who feed much grain. States, according to Mr. Christy. As a matter of fact, during the fit'st 5 months. United States make up a smaller proportion of the total than in past years. Monatliche Nachweise aber den Auswartigen Handel Deutschlands. a/Preliminary. Monatliche Nachweise uber den Auswartigen Handel Deutschlands. a/ Preliminary. from that source ;wre 75 per cent larcgr in the 1931 period than a yoer ago. season have been. regarded as favorable. bcinj made despite the favorable conditions existing during the season. Those in the industry> stated that they aro. satisfied since such Onbirts' . season. The pork has been of good quality and able to compete with Dan-ish . Products on the English markcts..
Hogs and Pork Products: Indices of foreign supplies and demand. Irish Free State : "
a : : : : : . 6 0 : . : .